Why should you be extremely wary if you’re considering getting cash by tapping your 401(k) plan? Typically, 401(k) loans mire you in red tape, with “gotcha” fine print and some requirements that may be impossible for you to meet. Life insurance policy loans, on the other hand, are easy. They put repayment entirely in your hands. And they give you the opportunity to grow your money even while you borrow it. To boost the appeal of 401(k) accounts as retirement plans, Wall Street and many employers promote 401(k) loans as a great source of easy money. But while 401(k) loans may be a source of money, they’re not great, and they’re not easy. In tight times and with stock market values at dizzying heights, many people instinctively look at what seems to be a mountain of money sitting in their 401(k) account and think about borrowing it. Some folks may forget that one of the many restrictions on 401(k) loans is that you can only borrow 50% of your account value, up to a maximum of $50,000. But even though the government has limited your ability to borrow larger amounts, there are still serious hazards to 401(k) loans. Marlene had a decent job as an administrative assistant. When she saw the brown stain on her living room ceiling early one fall, she knew her worst fears about her roof were true. It needed to be replaced – now, before the next storm. Fortunately, her 401(k) plan came to the rescue, and she borrowed the $20,000 she needed to get the work done. The roof was in place within two weeks. But then Marlene got some terrible news. She and several others in her department at work were being let go. Worse, her 401(k) loan of $20,000 would need to be repaid within 60 days. With no job, that was impossible. Marlene ended up owing income tax on the $20,000, plus a 10% penalty – $2,000 – and Uncle Sam wanted all of that by April 15, just five short months away. If you stop making contributions while you repay your loan and you’re in your 30s, a $10,000 loan could cost you $1,000 every month in future retirement income. If you’re in your 20s, that loss could become $2,000 per month! If you can’t repay your loan for any reason, you’ll likely trigger taxes and penalties, plus you’ll lose that retirement income. By the way, don’t think for a moment you can beat the penalties and taxes by simply turning your 401(k) loan into a 401(k) withdrawal. That just makes things worse. Generally speaking, you’ll pay taxes and penalties on all withdrawals you make before age 59½. While Nerd Wallet did an excellent job of pointing out two of the pitfalls of 401(k) loans, the fact is I’ve been warning of the hazards of 401(k) loans and explaining the advantages of cash value life insurance policy loans for ages. 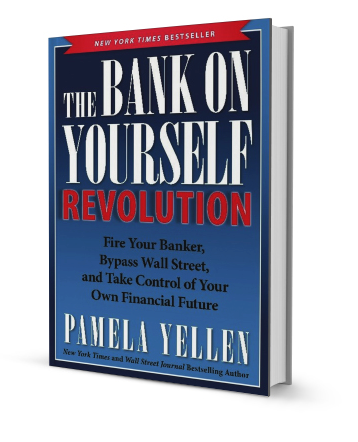 For example, in my New York Times best-selling book, The Bank On Yourself Revolution, first published back in 2014, I was already talking about the Harvard economist whose research revealed that fully 15% of 401(k) loans go into default. If you don’t repay the loan, including interest, according to the loan’s terms, any unpaid amounts become a plan distribution to you. You will be required to repay the loan in full – with interest – if you leave your job for any reason, even if you got fired or laid off. Any unpaid loan amount also means you’ll have less money saved for your retirement. Your plan’s balance can stagnate if you take out a 401(k) loan. When you’re strapped for cash, a much better alternative than a 401(k) loan is to tap into the living benefits of your Bank On Yourself-type dividend-paying whole life insurance policy or other cash value life insurance policy. Cash value life insurance policies have living benefits, which means, among other things, that as you pay your policy premiums, you build up a pool of cash you can access with no income taxes due. The most common way to access that cash before retirement is with a life insurance loan. Your life insurance loan will continue to accrue interest on the unpaid balance, and when you pass away, the interest and unpaid balance will be deducted from the amount your beneficiaries receive from your life insurance policy. But if your interest and unpaid balance ever grow so large that they threaten to exceed your policy’s cash value, your policy could lapse. So you and your advisor will want to watch that carefully. You’ll still get the same guaranteed cash value increase and the same dividends you would have received if you didn’t have a loan. To learn more about this amazing and valuable feature, take a look at How Bank On Yourself Whole Life Insurance Policy Loans Work. There are times when you simply must have the money. It’s time to replace the roof. Your washing machine just washed its last load, the dentist says it’ll cost $10,000 to fix those chompers. But you don’t have to pay finance company or bank loan rates for that new roof, new washer, or new smile! And you certainly don’t have to take the risks that come with a 401(k) loan. With some advance planning and preparation, you can actually bank on yourself. Think of being able to tell your banker or 401(k) loan committee to go take a hike! 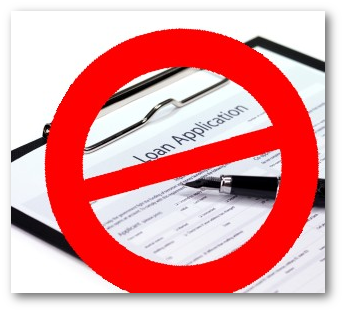 Wouldn’t you prefer a loan without government restrictions, and with the privacy of not having to discuss your financial needs with your employer or some loan committee? Imagine how empowering it will feel to be able to handle it all yourself! Get all the facts before you get the cash. 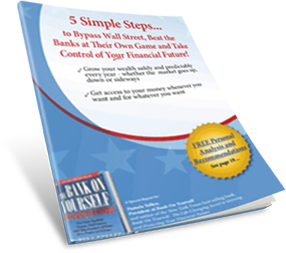 Download our Free Special Report right now: 5 Simple Steps to Bypass Wall Street, Beat the Banks at Their Own Game and Take Control of Your Financial Future. It will give you an overview of the Bank On Yourself strategy and help you see possibilities you may never have thought of before. Then, after you’ve reviewed the report, request a FREE Bank On Yourself Analysis. You’ll get a referral to one of only 200 advisors in the US and Canada who have met the rigorous training and requirements to be Bank On Yourself Authorized Advisors. Your advisor will look at your overall financial picture to find creative ways to solve your immediate need for cash and help you create a plan so that you never again need to consider the possibility of taking out a risky 401(k) policy loan – or a loan from any other outside financial source!